Raclette grill charcoal for 6 person Hot Stone Kaltenbach, stone plate, power 1250 Watt. 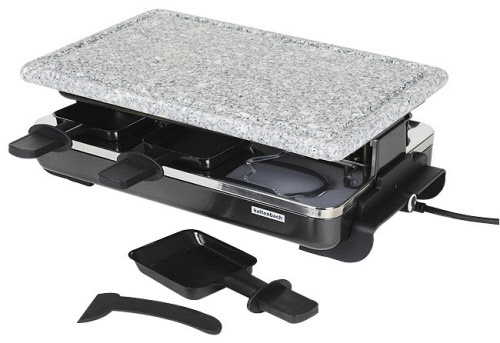 Add a natural stone grill plate to the classic Kaltenbach raclette grill (for six people) and create the perfect gourmet dinner for your friends. The polished natural stone grill top is ideal for preparing meat, fish or vegetables as it absorbs the heat quickly and distributes it evenly. This grill is an absolute must for raclette dinners or for those extra special indoor barbecues.